Corner Protectors Reduce Damage to Your Building and Vehicle by Absorbing the Impact. Building corner protectorscan be used outdoors or indoors to protect your facility from damage by forklifts, tow motors or vehicles. Building corner guardsare especially effect at preventing damage on loading docks and overhead door frames where trucks back in to unload. Building corner guards reduce or eliminate damage to the building as well as the vehicle by absorbing the impact. In heavy traffic areas truck damage to corners can be a constant problem. Building corner protectors can also be installed on H-frame racking, used horizontally as rack guards or horizontally on loading docks. 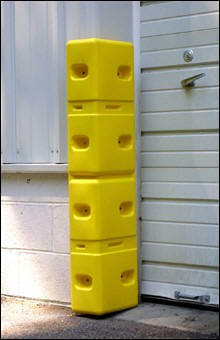 Building corner guards are made of high density polyethylene with UV inhibitors. Yellow in color for greater visibility. These building corner protectors are also rust resistant and stress resistant. Available in two sizes to fit most areas with inside measurements of 4" x 8" and outside measurements of 6" x 10'. Sold in sets of two in heights of 21" or 42" each. Easy installation with bolts provided. Order Corner Protection Here: Shop Now! See our complete selection of industrial safety products. For help or if you have a specific need contact us toll free at (800)869-9633 or by email. Click this link to see our complete line of products. Easy installation - bolts included. Reduce or eliminate damage to vehicles. Inside measurements 4" x 8". Cost effective way to prevent damage to your building and vehicles. Save now on corner protectors. Inside measurement 4" x 8", See details below for each item.